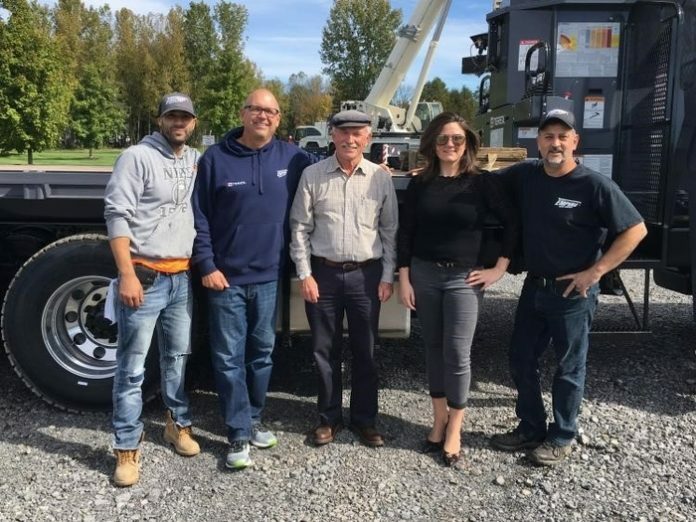 (L-R) are Louis Sanchez, Elmer W. Davis Inc. operator; Luke Lonergan, Empire Crane Company LLC CEO; Carl Benson, Elmer W. Davis Inc. fleet manager; Katie Pharoah, Empire Crane Company LLC sales manager; and Rick Caparco, Empire Crane Company LLC service manager. Elmer W. Davis, Inc. have picked up their new 2018 Terex BT28106 boom truck from Empire Crane Company, LLC in Syracuse, NY. The BT28106 will be the 9th Terex (4th BT28106) in their continually growing crane fleet. Elmer W. Davis, Inc. is the largest roofing contractor in NY and have become particularly fond of Terex cranes. Superintendent Damon Runyon expressed the “ease of service” with his Terex machines, “they are reliable cranes with almost no downtime”. About Elmer W. Davis, Inc.
Elmer W. Davis, Inc. is a roofing and sheet metal contractor that has been in business for over 80 years. They are the largest roofing contractor in New York State and during peak season have as many as 300 employees working in the field. Elmer W. Davis, Inc is owned and operated from Rochester, NY and they travel to jobs throughout central & western New York.